This revised edition of The Scientific Revolution highlights the difficulty of engaging, discarding, or assimilating religious paradigms in the course of scientific development. 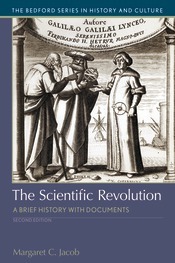 Jacob’s introduction outlines the trajectory of the Scientific Revolution and argues that the revival of ancient texts in the Renaissance and the upheaval of the Protestant Reformation paved the way for science. The collected documents include writings of well-known scientists and philosophers, such as Nicolaus Copernicus, Francis Bacon, Galileo Galilei, René Descartes, and Isaac Newton, as well as primary sources documenting discoveries in medicine, innovations in engineering, and advances in scientific investigation. New to this edition are the writings of John Toland and Gottfried Wilhelm Leibniz, who both attempt to redefine the role of God in an age of science, and an excerpt from Dialogue Concerning the Two Chief World Systems that provides context to the popular understanding of Galileo’s conflict with the Catholic Church. Document headnotes, questions for consideration, a chronology, and a selected bibliography support students’ study of the Scientific Revolution.